Bullish sentiment, expectations that stock prices will rise over the next six months, declined 2.9 percentage points to 29.5%. Optimism was last lower on 30th Sep. 30, 2015 (28.1%). This is the 37th out of the past 39 weeks with a bullish sentiment below its historical average-level of 39.0%. Neutral sentiment, expectations that stock prices will stay essentially unchanged over the next six months, jumped 7.7 percentage points to 49.3%. The spike puts neutral sentiment at its highest level since 21st May 2015 (49.8%). It also keeps neutral sentiment above its historical average of 31.0% for the 12th consecutive week and the 46th week this year. Bearish sentiment, expectations that stock prices will fall over the next six months, fell 4.8 percentage points to 21.2%. This is a four-week low. The drop keeps pessimism below its historical average of 30.0% for the 10th time in the past 12 weeks. 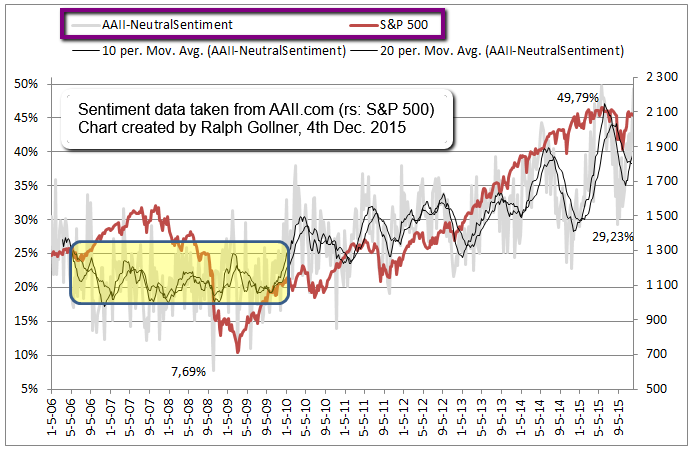 Neutral sentiment has now been above 40% for the fourth time in five weeks. Readings above 39.7% are unusually high (more than one standard deviation above the historical average) and have been associated with above-average market returns over the following six and 12-month periods! The most recent special question asked AAII members how third-quarter earnings impacted their outlook for stock prices. Nearly one of three respondents (29%) said that third-quarter profit reports have not caused them to alter their outlook. Several of these individual investors said that they maintain a long-term focus. About 22% said earnings had a negative effect. Some said that they reduced their expectations for stock prices as a result of third-quarter profit reports, while others said that the declines in earnings could lead to a reduction in stock prices. More than 13% said that they are more optimistic, mostly because of earnings growth.